With GPS tracking devices and hardware from Skypatrol, companies and fleet managers are able to monitor and track their driver’s behavior. We have written several blogs discussing the benefits of these capabilities, including cost savings, increased performance, and fewer liabilities. However, if you’re the owner of a fleet of vehicles and manage the drivers of those vehicles, how do you actually implement safer driving skills and behaviors? How do you teach someone who has probably been driving for most of their lives to driver better? Business owners and managers are most likely very good at what they do on a daily basis, but teaching necessary driving skills may not be in their playbook. Here are some steps you can take to actually improve your driver’s behavior. If you have any questions about our GPS hardware and other devices, contact our team today. We’re more than happy to answer any questions and we also offer a range of support to ensure you get the most out of our products. Looking at the current performance of your drivers will give you a foundation to build off of. Look at things like the current average number of car accidents a year or a quarter, how much time it takes for drivers to complete their tasks, and how much money you’re spending on gas. 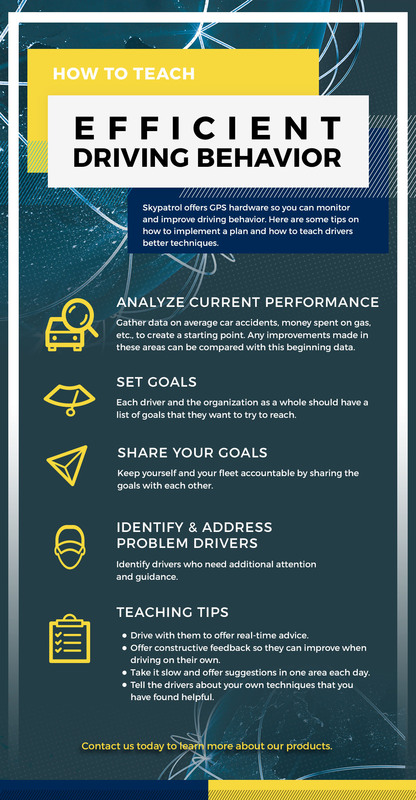 With this base line of data, you will be able to clearly see the types of improvements you are making after implementing GPS tracking devices and these driving behavior strategies. Each driver should have their own goals as well as the organization’s fleet as a whole. Start by creating minimum standards, such as gas usage, speeding, steering, braking, revving, and idling. These types of behaviors are ones that could increase the amount of money being spent, so having a minimum that everyone is trying to exceed will ensure success. You can set these standards against other similar organizations so that goals are attainable, but realistic. By sharing your goals with other members or executives of the organization, it will keep yourself and all of the drivers accountable. Let them know your plan, timeline for when you want to start seeing improvements, and your action plan for how to get there. When a goal or action plan is put in place, it will allow for open discussion to ensure that everyone is on the same page. This can be especially important if you work in a large organization where some drivers could get overlooked. Knowing the drivers who are currently underperforming, or who aren’t improving as quickly as you’d liked, could benefit from targeted training. After a period of time, when improvements are being made and you can see that there are fewer car accidents and less money spent on gas, share these results with all of the drivers and management. You can still look for areas of improvement and help those who need it, but sharing and possibly rewarding improvements, will go a long way in keeping positive morale. Drive With Them: If you want to see how a drivers behavior is currently in order to help them improve, it’s best to simply drive with them for a few days. You can assess their driving real-time and offer constructive feedback. Constructive Feedback: The trick is offering constructive feedback so that they have a clear understanding of what they are doing and specifically how they can improve. If they have an issue with speeding, you can suggest using a program that displays the speed limit either on the vehicle’s dashboard or on their phone. Go Slow: If you are driving with someone who is new to the company and may not be familiar with certain standards, go slow and focus on one area for each day. Technique: There are a variety of driving techniques that can help improve their gas mileage, for example, or how to slowly and efficiently start moving after a red light has turned green. Having expert advice will provide insight into how they can improve when on their own. At Skypatrol, we realize that training a fleet to drive safely and efficiently, when they are already familiar with how to drive, can be tricky. But these methods and tips will only help your company save money and ensure that there are fewer accidents on the road. 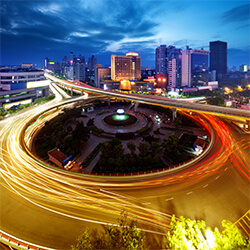 Skypatrol offers a variety of GPS tracking devices and hardware for your fleet of vehicles. Contact us today to learn more about our products and to start monitoring the efficiency and safety of your drivers.